In 1954, Federal Marshall Teddy Daniels and his partner investigate the mysterious disappearance of a client at the secure forensic, mental health hospital situated on Shutter Island, only accessible by boat.. as a storm is brewing. Before Shutter Island (2010) starts, the opening soundtrack sends shivers down your spine. As the ferry to Shutter Island looms into view through the fog, you feel a sense of foreboding, even without knowing the plot. It’s 1954, and we meet Federal Marshall Teddy Daniels (Leonardo DiCaprio) accompanied by his new partner, Chuck Aule (Mark Ruffalo). The pair are heading to Shutter Island’s Ashcliffe forensic secure Hospital – an imposing Gothic style building for patients with mental health problems, who are a danger to society – and the only buildings on the island. The men are investigating the disappearance of one of the patients, Rachel Salando. Salando killed her children by drowning them. Aule and Daniels strike up some small talk, with Daniels stating he lost his wife, Delores (Michelle Williams) in a fire. A boat is the only way on and off the island. On entering the hospital grounds accompanied by guards, we pass through the gates as this music continues to strike increasingly frightening and almost ominously. We see the hospital buildings, Wards A (male), B (female) and C. An old fort houses Ward C where the most dangerous patients reside. There is also a lighthouse where the sewage works are based. The patients are seen in shackles or handcuffs in the hospital garden accompanied by orderlies. Daniels and Aule are shown round the hospital by Head Psychiatrist, Dr Cawley (Ben Kingsley), as we see round the hospital. There’s locks, barbed wire, barred windows and iron mesh within the buildings to contain the patients. We learn more on Salando and listening to her story, Daniels experiences a blinding headache. On checking Salando’s room, a clue is found in Salando’s writing stating “Law of 4, Who is 67?.” And it is revealed she left barefoot, between 10pm and 12am, when an orderly took an against protocol toilet break..
Cawley appears evasive, he refuses to let staff records be read, Ward C and the Lighthouse to be searched – claiming all have been checked previously – and he reports Daniels can’t talk with Salando’s psychiatrist, as Sheenan left on a planned holiday on the morning ferry. Furthermore, Daniels is unable to contact Sheenan as the telephone lines are down due to the storm. On entering the Doctors apartment, some music triggers flashbacks for Daniels of some unpleasant experiences in the army assisting at the liberation reprisals at Dachau. And he meets another of the psychiatrists, a German, Dr Naehring (Max Von Sydow) with whom Daniels appears uneasy. There is heavy rain, as Daniels and Aule leave for their sleeping quarters for the night along with thunder and lightning. In bed, Daniels gets memories of Delores telling him that Rachel has not left the island, and asking if he remembers their visits to the summer cabin. And that he has to face a man named Laeddis at the hospital. On questioning the patients, Daniels becomes increasingly frustrated and angry as he asks them about Rachel yet now appears more focused on the whereabouts of this Laeddis character. Daniels confesses to Aule, that Laeddis was the arsonist who set fire to the building his wife died in. And that this was part of the reason Daniels took this particular case as he wanted to confront this man. The use of rain in this movie is crucial to the plot as well as adding more intensity to the storyline. With the stormy weather in combination with the plot and setting, almost used to Gothic horror proportions. Daniels and Aule are unable to leave the island as planned and remain on the island for a few more days. It is during the storm that the pair take refuge in a building in the hospital cemetery. Daniels confesses he wants to kill Laeddis to his partner for his part in his wife’s death. He adds, that he’s heard from an acquaintance, George Noyce that experiments are taking place on the island using the patients as guinea pigs. Chuck however suggests to Daniels that he staff understand he is investigating this, and see him as a dangerous threat. Daniels reads the note a patient wrote to him in secret during the interrogations. He reveals the note smeared by the rain, says “Run”. And as the rain pelts down, Daniels decides to investigate more, rebelling against the doctors restrictions. After the storm, Daniels searches Ward C and the lighthouse hoping to find the answers he’s looking for. The film invites you in from the start, for you to assist Daniels in solving his case. Seeing the hospital from his view-point as you pass through the gates with him, sit with him as he questions the patients and staff, you feel increasingly involved in the story. Like Daniels you begin to question everyone’s motives, for better for worse. In a troubled and vulnerable performance, DiCaprio gives a transfixing portrayal of Daniels and certainly should have won an Oscar for this. We learn more about his character, and his troubled back story of his role at Dachau. And of his harrowing experiences there. We learn more the loss of his wife, with his memories of her in almost over the top HD colour, and her conversations with him which helped guide his actions. And his motivations to face his nemesis, the man responsible for her death and his later beliefs leading to his exploration of the lighthouse due to his belief that there are experiments taking place there, as supported by an acquaintance of Daniels. Cawley, is first seen as an apparently kindly humane psychiatrist but then adds to your uncertainties appearing more sinister in his dealings with Daniels. You felt – along with DiCaprio – he was hiding something with his many restrictions to help resolve the case. Almost indirectly tempting him to explore the island and the buildings more. Also when Daniels later tells Aule that an acquaintance George Noyce told him that there are unethical experiments happening on the island to these patients. You question the buildings, is the lighthouse a sewage work or something more sinister… why shouldn’t Ward C be checked? As the full story is revealed, you’ll find there are as many twists and turns with these characters and the storyline as there are in the hospital corridors. And it’s almost like a Labyrinth as DiCaprio’s Theseus searches for the Minotaur of Laeddis to battle this particular demon. This review was added to The April Showers Blogathon run by Movie, Movie, Blog, Blog. Other reviews with this cast include Gatsby and Django Unchained with Leonardo Di Caprio and Ben Kingsley stars in a review of The Walk and Oscar Winners in Superhero movies. Terrific summary of a real nail-biter. 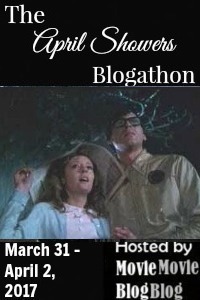 Thanks for contributing it to the blogathon! I agree, there are so many twists and turns to the story. I think I held my breath for the last half an hour.